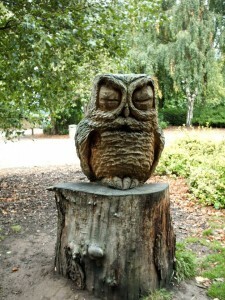 Things to do at Elvaston Castle? Elvaston Castle is a stately home in Elvaston, Derbyshire, England. The Gothic Revival castle and surrounding parkland is run and owned by Derbyshire County Council as a country park known as Elvaston Castle Country Park. The country park has 200 acres (0.81 km2) of woodlands, parkland and formal gardens. Board members now needed at Elvaston. These historic gardens and buildings of this wonderful estate, situated between Derby and Nottingham, are in need of investment, sound strategic management of a new future, all combined with a sensitivity and acknowledgement to the work of preservation and community engagement that has gone before. Elvaston Castle Estate is a much loved community asset owned by Derbyshire County Council. It is situated between Derby and Nottingham and attracts over 350,000 people every year, who enjoy its nationally important gardens and historic buildings. It should be a real gem, but needs investment and a new approach to secure its future – one that protects its value for conservation, heritage and access whilst developing financial sustainability – and that’s where you come in. The Castle and its current partners have worked closely with the local community and others to develop an exciting Vision for the future of Elvaston which we believe can be best delivered by a new managing body for the Estate such as a Charitable Trust. Elvaston Castle is therefore looking for a strong Chair with the drive to recruit and lead an advisory ‘Development Board’ for Elvaston Castle. The Development Board will also bring commercial and business acumen, innovation, creative flair and enterprise to help shape initiation of the Vision. • Excellent communication and interpersonal skills, including communication across a range of media, tact and diplomacy – passionate about the work you are leading and able to communicate this powerfully and in a way that inspires others. Role and profile of the Chair – view, print or download here. Terms of Reference for the Development Board – view, print or download here. Original text of advertisement for the Chair- view, print or download here. Nick Sellwood, National Trust, Hardwick Consultancy Office, The Croft, Doe Lea, Chesterfield, Derbyshire, S44 5QJ. 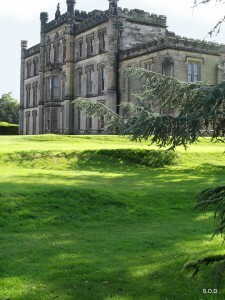 Derbyshire County Council are moving towards the creation of a Development Board for Elvaston Castle and the grounds. The body created, if approved by elected members, will act as an advisory body to the Council, helping to provide a pathway towards a Single Management Body, which will ultimately accept devolved responsibility for the management of the estate. The Single Management Body will be tasked with delivering the core ten year vision for the estate, including all the elements that the House and Country Park can offer, from heritage, conservation and dedicated public access. You can see the vision for Elvaston on our Futures page here. The role’s of the expert panel will be voluntary, with expenses and childcare costs provided. There are a variety of models for the creation of Advisory Boards and ‘professional’ volunteers to enable input to development plans. English Heritage Advisory Board – you can see how a full, expert advisory board functions and its remit, set against a development framework here. World Heritage Sites– although not explicitly relevant to local projects, the UNESCO model of selection and advisory management offers smaller projects some key insights into how heritage, the natural environment and public access can be measured and monitored. See the model on the pages of Wikipedia here. St. John Canada, Growth & Community Development – this Canadian City offers an exemplar of how a public body manages and makes available practical, operationally focussed heritage management and information support for residents. This is Canada with heritage writ large. You can see a fuller, local report about this interesting development in the Elvaston story on the web pages of the Derby Telegraph here. 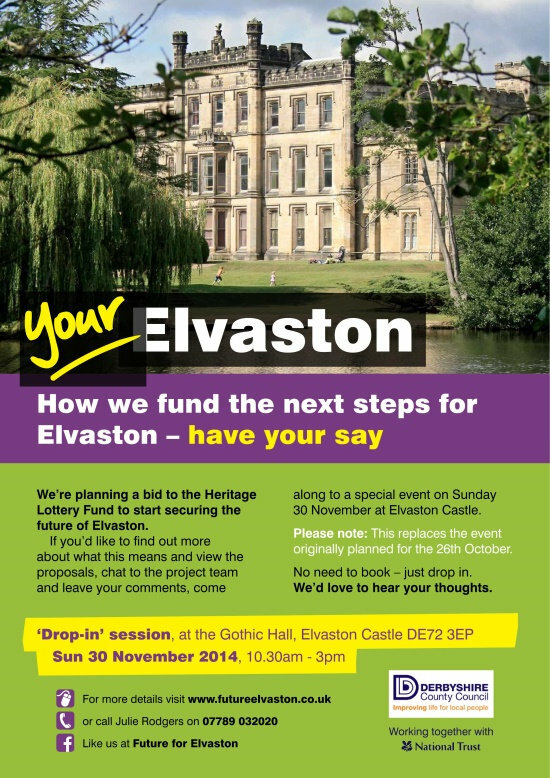 We recently published a date for your diary, 26th October, for a planned consultation event at Elvaston Castle. This has now changed. The event, at the Gothic Hall Elvaston, has now been re-arranged for Sunday 30th November from 10.00am until 3.00pm. The Elvaston Castle team have apologised for the movement of the date, but are still looking forward to being on hand to get your feedback and counsel on the proposed Heritage Lottery Fund bid. 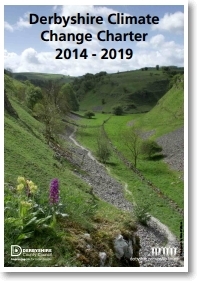 Derbyshire County Council have published this month the County’s Climate Change Charter. This document is currently undergoing a process of consultaton. You have until 5th November 2014 to make known a wish to be involved in the County’s Climate Change Charter processes, or to make comments on the document as it stands today. The document and the aligned processes are set to enable the County to define actions and priorities for tackling climate change. Identifying constituent contributors to climate change and developing an Action Plan to tackle the issues are a key part of the process. The Climate Change Charter processes are also designed to give communities and Council partners “a point of reference for climate change action“. You can find more information about the Charter on this DCC web page. You can also discover how to contact Alison Wheeldon at the Council, who is co-ordinating the responses to consultation activity. Ethical, social and community business – does climate change matter? Yes it does. Attention to climate change by our local authority, businesses, community groups and individuals is all part of a collective effort to preserve resources, the quality of those resources and their continued availability for the foreseeable future. Rural enterprise, or any community business which seeks to establish new employment or training for young people, whatever the setting, should be particularly attentive to the issue. When creating jobs, which are more sustainable when linked to energy efficiency, resource consumption reduction and recycling, for example, helps create habits of prudence and conservation that individuals take with them to other organisations and also helps transfer their new found awarenesses to family and home life too. A Community Interest Company should also have a Climate Change/Sustainability agenda and policy too. It makes the business proposition to interested partners more attractive. It enables the company to have an effective ‘triple bottom line’ approach to an ethical business proposition and, ultimately, makes project funders aware and interested in the wider delivery of both the business and the social outcome hoping to be achieved. Action on climate change is a win-win proposition for a local authority, the competent and efficient social business and the individual and their family too, we think. With the temperature getting a bit more seasonal, but with plenty of sunshine still lighting up the footpaths, then now is the time to think about dusting of the waterproof jacket and polishing those walking boots. The National Trust have just published a new book for the leisure walker, Great British Walks, which features some of the choicest landscape and countryside walks in the UK. If the wandering bug has started to bite, you can view the details of this new title and purchase a copy on-line from the National Trust Bookshop. (…would make a great Christmas present). Don’t forget to join William the Tree Transplanter on Sunday 12th October 2014 at Elvaston Castle Country Park. This is a great opportunity to stroll throughout the grounds of Elvaston Castle and enjoy the fruits of William Barron‘s efforts and to discover ‘The British Winter Garden’ he created for the 4th Earl of Harrington. “William Barron’s work at Elvaston Castle, Derbyshire, the seat of the Earls of Harrington, became famous when the gardens were opened to the public during the 1850s. Working with his employers, Barron utilised a variety of landscape gardening techniques including the provision of topiary, rockwork, a lake and hundreds of trees, many of which were transplanted great distances, to transform the grounds into a private chivalric fantasy realm. Subsequently, with the support of the Stanhopes, Barron utilised this knowledge and experience to develop careers as nurseryman, tree transplanter, and landscape gardener receiving multiple private and public commissions including some for major urban parks such as Peel Park, Macclesfield (1854)”. You can locate Elvaston Country Park here… a great place to walk anytime! A gentle incline of fundraising and development consultation is starting to rise out of the wooded landscape at Elvaston Castle. The date above, Sunday 26th October, offers you the chance to look at funding and development proposals, as well as speak to members of the project team at Elvaston. Why not come along and have your say…the team will be in attendance from 10.30am to 3.00pm at the Gothic Hall. “We’re planning a bid to the Heritage Lottery Fund to start securing the future of Elvaston. If you’d like to find out more about what this means and view the proposals, chat to the project team and leave your comments, come along to a special event on Sunday 26 October, between 10.30am to 3pm at the Gothic Hall, Elvaston Castle, DE72 3EP. No need to book – just drop in”. Did you know that there will be an international celebration of Robin Hood in Nottinghamshire this month? October 25th 2014 has been designated the day for the main event. There will be plenty to celebrate in Nottingham of course, with businesses offering Robin Hood food, retail promotions and the landscape of the city will be awash with Sherwood Green, we have no doubt. If you can’t get to Sherwood Forest, never fear. Why not don your green garb and visit Elvaston Country Park. There the landscape is full of trees and grassland, echoing the wild nature of the English forest. While you cavort with the children in the treescape, get aunties, uncles and grandparents to visit the listed formal gardens for a smoother, quieter experience. Whatever your taste in food or drink, why not bring along a Friar Tuck picnic basket to Elvaston Castle, you can be assured of a pleasant time in the Castle setting? Below we have listed some links to other interesting web sites and articles on International Robin Hood Day. Make yours an Elvaston Day any day, it’s always great! You can locate Elvaston Country Park here. Read about Robin Hood Day in the Nottingham Post here. Enter your email address and receive notifications of our latest news by email. ‘Everything Elvaston Castle is designed to provide readers and visitors with literally everything they’re looking for on one website. Whether your interest is in the estate’s historic past or you want to know more about plans for its future, you’ll find it all here. You can read about what events and other great things are scheduled to take place in the coming months. To find out more about Everything Elvaston Castle CIC, click ’About Us’ on this page or get in touch with your comments, thoughts and ideas.